What happens when you die? 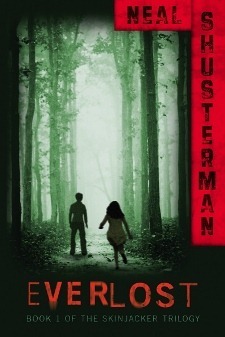 In Neal Shusterman’s Everlost, if you’re an adult, and you know where you are going, you get there. If you’re a child, and either don’t know where you are going, or somehow get bumped off track on the way there, you end up in Everlost—a place where the souls of children children drift and slowly forget who they were. Everlost is the first book in the Skinjacker Trilogy, followed by Everwild and Everfound. In book one, Allie and Nick are two teenagers involved in a head-on crash in Upstate New York. They collide on their way into the next world, and end up in Everlost, where they must first come to terms with this new situation, and then figure out what to do next. Everlost is a young YA book, for 11-14 year olds, though it does deal with the topic of death and the afterlife. The plot moves quickly, is very well written, and enjoyable, even for adult readers. I read the book over the course of about a day, and I took plenty of breaks. The characters are well done, and the plot imaginative and well thought out, with plenty of historical tie-ins which serve to increase the interest levels for the reader. The only issue I found with the book itself has to do with the character Nick. At the time of the accident, Nick is apparently eating a chocolate bar, and ends up with chocolate smeared on his face. Children in Everlost are stuck wearing for eternity what they were wearing when they died. This means that Nick forever has chocolate on his face. I understand why, but this chocolate on his face makes me think he is seven at the start of the story, not in his teens. It took a while for me to shake that interpretation. It’s a small point, but it did distract me later in the book, when I had to alter my vision of how old he really was. The other issue I ran into, could be attributed to my Kindle. I found numerous copy-edit mistakes in the book; everything from misspelling a character’s name, to missing words, to formatting problems. I’m not sure if this is a frequent problem for e-readers, or just an issue with the electronic version of this book on Amazon. I suspect the latter. I don’t have a lot of experience in reading on an e-Reader yet (less than a dozen books thus far), but I’ve never seen quite so many errors on a professionally edited and popular book. Overall, I enjoyed the book, and look forward to reading the next two in the coming weeks. Both are already downloaded to my Kindle, and ready to go.